Please also review our Harley Tips Page. We have been adding Tech Q&A to our site since 2004 and we have plenty to share via the Tips A-Z Index for free. You can search our site with the Search Box on the top right of our navigation. This will bring in results from our videos, tech tips and more. Still no luck? Let us know. We are real, living people and we have a phone. Please feel free to call us. 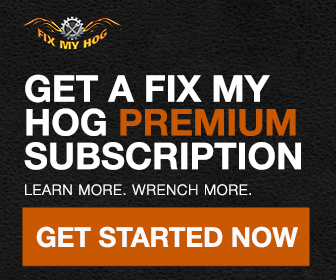 We can help you place an order and answer any questions you may have about Fix My Hog. You can also drop us a note and we will get back to you. Please review our Harley Tips Page. We have been adding Tech Q&A to our site since 2004. Check it out now. Also Search our site with the Search box on the top right of our navigation. This will bring in results from our tech tips, videos and more. We post all email inquires on our Harley Tips page when we can. Sorry we cannot reply to all questions personally.